An outstanding science student, Denyse was awarded Lehigh University’s Botstiber Merit Scholarship. At her high school, Lycée Notre Dame De Cîteaux, she was a leader in the Girl Guides and hosted a radio show on youth conflicts and resolution with the organization Search for Common Ground. Denyse majored in industrial and systems engineering with a minor in business at Lehigh. During her time on campus, Denyse was a UN youth representative for the Darfur Rehabilitation Program, as well as a Lehigh University Diplomat at the Admissions Office. Previously, Denyse interned with Ernst & Young’s Financial Services Offices in NYC. In the summer of 2015, Denyse returned to Ernst & Young for a client serving internship in the FSO Technology Advisory Program. 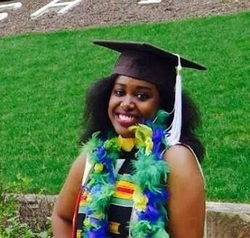 Upon earning her Bachelor's degree in 2016, Denyse accepted a full-time position as a Systems Analyst ​at Ernst & Young’s Financial Services Offices in NYC.